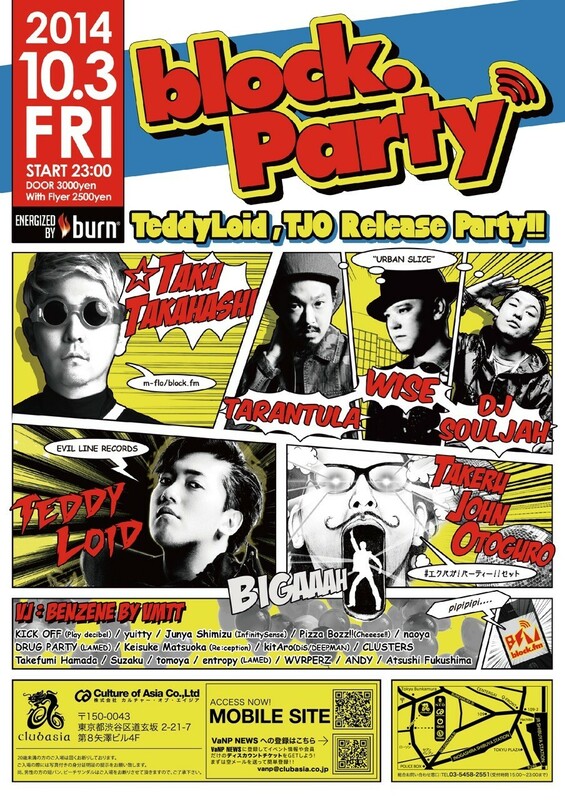 ARTISTS: ☆Taku Takahashi, DJ SOULJAH, WISE (TERIYAKI BOYZ®), Tarantula, TeddyLoid, TJO (Takeru John Otoguro), KICK OFF, yuitty, Junya Shimizu (InfinitySense), Pizza Bozz! !, naoya, BASEMAFIA, Keisuke Matsuoka, kitAro, CLUSTERS, Takefumi Hamada, entropy(Daiki Higuchi&S.H.O). and TeddyLoid who released major album in September will appear! He will play with live set! It will be DJ career start in 2010. Since it was taking charge of the school-days drum, "sound" is loved supremely. These days, it is strongly affected in the Bass sound which sounds in the breast of the skyrocket which makes everybody crazy. Favorite genres are 70 s and Disco! The sound at that time of everyone's having danced is dropped in a modern style. In the regular event, DJ is performed in various parts of a metropolitan area like every week centering on "STARBEATS" and "FUNNEL", and an always new stimulus is looked for. Moreover, it dealt also with ize [ of one's event "OOPS /!! /" / an ogre ], and in 1st Anniversary performed to 12/10 in 2012, "TJO" was invited to guest DJ and it had been one day which shows the presence of the event anew, The year also begins and it is 2013. Dj kitAro starts a new deed. Wholly, don't look aside!!! !.